Michael Keaton talks about the ambiguity of his Spider-Man: Homecoming villain. Has Gotham cast another major DC comics character? There’s already rumors about the name of the next main X-Men movie. Don’t expect new X-Files episodes for a good long while. 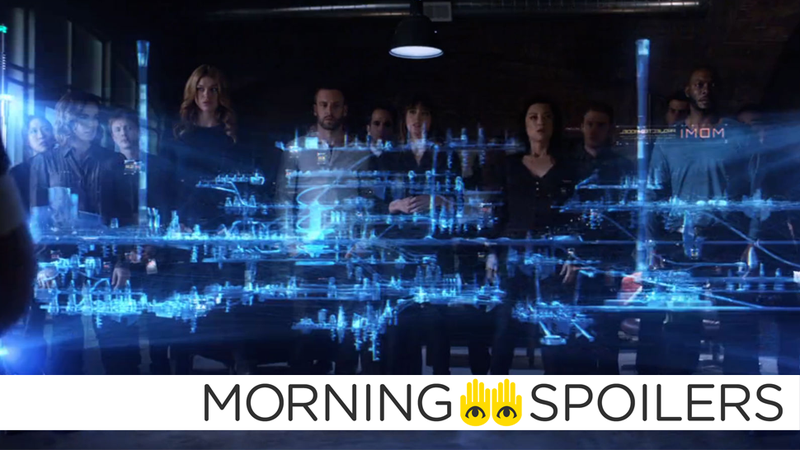 Plus, new footage from The 100 and Transformers: The Last Knight. Spoilers Now! Yeah, Vulture, recently. But not to give too much away, but interestingly, he is and he isn’t [a villain], that character. He’s a really interesting — and more interesting than I thought — villain because there’s parts of him that you go, “You know what? I might see his point.” Really, really. It makes it interesting to play. Yeah, it’ll be a solo movie. It’ll be populated with a lot of characters, but it is still Deadpool’s movie, this next one. We’re pushing forward very hard. I think by every account we will shoot it this year, and we’re on our multiple draft now. It’s taken different twists and turns, but it’s really coalescing, and we’re very, very excited. We’re a little nervous, because now we feel like we have to live up to the first movie, but at the same time, we have to have faith, and we have an extreme passion still, and as long as we have passion still, and it’s not a mercenary, venal play, which we don’t think this is, I think we’ll be in good shape. Here’s another TV spot for the film. The Hive awakens in a new clip from the film. Broderick – Male, 30-40, Caucasian. Can say volumes with just a look. Strong thoughtful and private, he’s unaccustomed to being questioned or feeling a need to answer to anyone, to an extent can verge on arrogance. Marjorie – Female, 30-40, Caucasian. An elegant and intelligent advisor to her husband, she struggles to find her place outside of their relationship, as others tend to view her as just a pretty face. Strong and resourceful, she’s not afraid to break the rules when the situation demands it. Marty – Male, 30-40, Caucasian. Broderick’s younger brother; he is intelligent, charming and articulate. He comes across as a man of the people but secretly covets power. Kevin – Male, 30-40, Open. Slight of build, his mind is his greatest asset. Always prepared with a plan, his outlook on life is the glass is always half-empty and often cracked and dirty as well. Though his outlook can be grim he has a droll, dry sense of humor. Grady – Male, 25-35, Open. Impetuous and brash, he has serious impulse control issues which frequently get him into trouble, whether it’s women, booze or fighting. He loves life and lives in the moment, for better or worse. Christine – Female, 18-25 to play 18, Caucasian. Soulful but still learning the ways of the world, she has the arrogance of youth. Impetuous and independent, she is also deeply devoted to her family. Timothy – Male, 25-35, Open, SFXMU required. Supremely athletic. The ultimate picture of cool. He’s calm under pressure and willing to do anything to get the job done. Speculate away in the comments below! Deadline reports the Raymond J. Barry has joined the cast as a Temple Shaman, who apparently comes into Bruce Wayne’s life “with the stated intention of unlocking the potential of his own mind. While the Shaman says the fate of Gotham depends upon Bruce becoming the man the city needs him to become, the truth behind his intentions proves to be far more sinister.” Nerdist speculates that the description sounds a lot like it could be the show’s take on Ra’s Al Ghul, with a relationship between the young Bruce and this Ra’s similar to the one seen in Batman Begins. However, this is all simply speculation for now rather than an actual confirmation of the Shaman’s identity on the show. With Jerome (guest star Cameron Monaghan) on the loose with one target in mind, Bruce and Alfred’s safety is compromised. Meanwhile, Gordon’s uncle Frank (guest star James Remar) pays him a visit, and Nygma and Penguin are forced to confront their issues face-to-face, with possible deadly consequences. Yeah, so John is working on a rewrite of that script for Marvel at the moment. We have not seen a new version of it. He’s been on production of his show, over in London, and on Season 3 of American Crime, so those are the things that have been top of mind for him of late. But I have heard from Marvel that he is working on a revision to that script. Meanwhile, Fox chairman Gary Newman offers a reassurance that the show is not canceled, but it will miss out on a summer return. Wayward is not cancelled, but it will not be on this summer. Wayward didn’t come together quickly enough for us to have it this summer. There have been discussions about casting. We’re still talking about it, it’s possible you’ll see Wayward at some point back on FOX. But we are focusing a little bit more heavily on unscripted this summer. We’re deep into development on that. We’re expecting a script shortly. The materials we’ve seen so far have been very, very promising. Development across the board this year is a little slower than usual, so we’re not, unfortunately, ready to make an announcement about it, but we’re very encouraged. Question: Are you using characters from the X-Men universe? Nix: Some. Again, without getting into specifics, it’s sort of designed to sidestep questions like, “Where is Wolverine?” You sort of have to answer those questions. I didn’t want to do anything like, “Wolverine is just off screen!” It exists in a world where those questions are answered without needing to name a lot of names or spend a lot of time dwelling on those issues. Within that, there is certainly a certain amount of those characters that I can use and I’m using some of those. Other characters I’m inventing but everything is invented with a nod to the existing mythology, if that makes sense. How should I put it? Again, it’s so weird to dance around these specifics. When I was pitching the show, I pitched some characters that appeared nowhere in the mythology but the guys from Marvel, when I started describing them, all gave each other knowing nods, where it was like, “Oh, I see what he’s doing, yes.” I tried to do a lot of that. I didn’t want to get into the realm of like too much like, “New X-Men here we go!”, and at the same time, with something like this, there’s a little bit of fan service but it’s also… You don’t want to sound douchey saying something like this, but I’ve been really impressed with how a lot of people have talked about joining the Star Wars franchise and how when you do that, there’s a sense of respect. You don’t want to be slavishly doing the same thing over and over again that everybody else has done, but at the same time, you’re conscious of, “This is important. I owe something to my ten year old self right now. I need to respect that.” I need for that kid who is obsessively reading comic books, I need there to be something rewarding for him where he’s like, I didn’t waste my time. I know what this is. Lucifer must find the antidote to the Professor’s poison before it kills Chloe. He travels to hell to find the Professor’s soul and get him to turn over the antidote. While he’s there, he is forced to confront his guilt about Uriel’s death. Mom heads to hell to get Lucifer back, but Lucifer still feels betrayed by his parents because of something he discovers. As Dreyfuss gets closer to making progress on his mission, important parts of his past come to light. His former partner returns to settle the score from years before and it becomes evident that Dreyfuss’ involvement in the supernatural is not something new. Don’t miss learning how Malcolm Dreyfuss came to be. Finally, everyone prepares for the end of the world (seemingly by trying to kill each other all the time) in a new trailer for the next season.